Posted on February 13, 2019 by Smorgasbord - Variety is the Spice of Life. I requested several books for Christmas as I love having a full TBR locked and loader on my reader to start the year. I have been storing up some of my reviews to share over the next couple of weeks as I am going to be offline during the day-time with some offline projects and jaunts. The first review is by USA Bestselling Romance Author Jacquie Biggar and her book The Beast Within (Mended Souls Book Two) a paranormal/suspense/thriller/romance. Let me set the scene…. since this is the second book in the series the first being The Guardian which introduced Lucas Carmichael and Scott Anderson who had it all, money, fame, and fortune. But one night’s stupid mistake takes everything they thought they cherished and dumps it upside down. And threatening his key witness. As the stakes rise, can two people get a second chance at love? Or will a killer become the winner? My review of The Beast Within. I am open minded about the existence of other worldly beings, and would love to think that there were a couple of guardian angels looking out for me and mine. Julie Crenshaw needs all the help she can get as she is at risk from the very serial killer she is investigating for her paper. Still coming to terms with being widowed, Julie is fighting the temptation to be drawn into a new and complicated relationship with the good-looking lead detective, all the time being watched over by the husband she lost to a fatal car crash. He in turn is at odds with the angel he has been partnered with, and who is responsible for the crash that killed him. They are supposed to be working together to get over their animosity, but there is a lot of work needed to achieve that. Despite picking up the story in the second book, the author introduced the previous characters in a timely fashion which meant it was easy to get right into the plot as a stand alone thriller. From the middle of the book the story gathers pace, as Julie researches the possibility there is more to the killer than meets the eye, racing towards an exciting climax as the characters of this world and the next come together. I will be reading more of this author’s books as there is certainly plenty to choose from across the romantic genre. 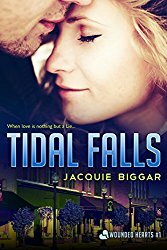 Jacquie Biggar is a USA TODAY bestselling author of Romantic Suspense who loves to write about tough, alpha males who know what they want. That is until they’re gob-smacked by heroines who are strong, contemporary women willing to show them what they really need is love. She is the author of the popular Wounded Hearts series and has just started a new series in paranormal suspense, Mended Souls. She has also contributed to several successful anthologies. This entry was posted in Smorgasbord Book Reviews and tagged Jacquie Biggar, Paranormal Romance by Smorgasbord - Variety is the Spice of Life.. Bookmark the permalink. Thanks for the reblog, Charles, appreciated! A lovely review of Jacquie’s book, Sally. I also read book 2 before I read book 1 and it was fine as a standalone story. I am looking forward to book 3 in this series. Thanks, Sally. Great review. Good luck to Jackie and I hope your projects go well. And happy birthday! Thank you, Olga. I was thrilled to see this lovely review! Excellent review. Putting this on my TBR list, along with book one. Sally Cronin of the Smorgasbord #blog #reviews The Beast Within- my first thriller! I’ve read a few of Jacquie’s novels and they are always entertaining and filled with heart. I so need to catch up with more of them. What a wonderful review. Congratulations to Jacquie, and thanks for sharing, Sally! A great review of Jacquie’s book. I love that it’s set on Vancouver Island. This place is so inspiring! Thanks, Darlene! Good review, Sally. I also enjoyed this book very much. What a great review of Jacquie’s book, Sally. Congrats to Jacquie! The conflict between the dead husband and the angel sounds like a treat Sally. I’m glad you mentioned that part. I can’t wait to read this one. Hugs to you and to Jacquie.